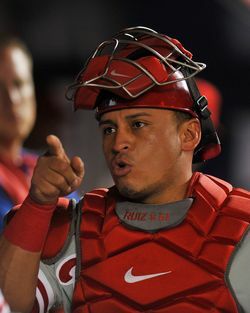 Phillies catcher Carlos Ruiz was a late bloomer, reaching the Majors at age 27 and eventually shaking off the backup label. He received MVP votes in 2010 and '11 and made his first All-Star team in 2012, but after the '12 season was slapped with a 25-game suspension for testing positive a second time for taking Adderall, which is used to treat attention deficit hyperactivity disorder. His 2013 season was his least productive since '08, and the man known as Chooch is heading into free agency for the first time. Among those who caught at least 250 games from 2010-12, Ruiz is tops in all three slash stats: batting average (.303), on-base percentage (.388), and slugging percentage (.454). Ruiz was about as good a hitter as Joe Mauer was during that time, and easily better than Yadier Molina, Miguel Montero, Brian McCann, or Matt Wieters. On a rate basis using weighted on-base average, Ruiz's offense was on par with non-catchers like Billy Butler, Nick Swisher, Carlos Beltran. He topped Ryan Zimmerman, Dustin Pedroia, David Wright, Curtis Granderson, Shin-Soo Choo, Nelson Cruz, and many other very good hitters in wOBA during that time. FanGraphs wins above replacement puts Ruiz's total 2010-12 contribution on par with Wright, Prince Fielder, Jose Reyes, and Carlos Gonzalez. Though Ruiz's work went under the radar, he was recognized with MVP votes in each of the 2010, '11, and '12 seasons. How about 2013? Ruiz posted a .268/.320/.368 line, so even in a down year, he got on base more often than the typical catcher. And though it may be arbitrary, agent Marc Kligman can point to a more Chooch-like .288/.343/.444 line over the season's final two months. A right-handed hitter, Ruiz excelled against lefties to the tune of a .300/.374/.463 line. Defensively, Ruiz is above average at blocking pitches, according to a stat from Bojan Koprivica. A qualifying offer is not in the cards for Ruiz, so unlike fellow free agents Brian McCann and perhaps Jarrod Saltalamacchia, he will not cost a draft pick to sign. Ruiz is a buy-low candidate who would have required a significantly larger contract a year ago prior to the suspension coming off a great season. As mentioned earlier, Ruiz had a down year with the bat, showing below average power for a catcher and falling well below his own recent norms. Why did Ruiz's batting average, walks, and power take a dive this year? One way or another, his amphetamine suspension was a factor, most likely in that he started his season a month late without a normal spring training. It's also possible that he was affected by the pressure from his first contract year. Ruiz's relative struggles could also simply be age-related decline, as he turned 34 in January. His 16 home runs in 2012, in particular, appears to have been a fluke or at least something that will not be repeated. On the defensive side, Ruiz cost the Phillies 23 runs from 2007-11 due to pitch framing, according to a Baseball Prospectus article by Mike Fast. Ruiz has had a DL trip in each of the past five seasons, missing about 23 days on average. Teams will have to ask if at age 35 Ruiz will be able to play 115 games or so. A team signing Ruiz probably needs a better than average backup catcher. Ruiz, a native of Panama, has two sons, also named Carlos. He's a family man who enjoys his horses on his ranch in his native country. Brian McCann, Jarrod Saltalamacchia, A.J. Pierzynski, and perhaps Dioner Navarro are the other starting catching options on the market. Pierzynski will be Ruiz's main competition, in the aging backstop bracket, and A.J. took a one-year deal last winter and may again. According to MLB.com's Todd Zolecki, Phillies GM Ruben Amaro Jr. recently said of Ruiz, "We'd like to bring him back. He knows we'd like to bring him back." The feeling appears to be mutual, as Ruiz told Ryan Lawrence of the Philadelphia Inquirer he'd like to finish his career with the Phillies. Ruiz is a fan favorite in Philadelphia and they lack a promising alternative, especially one who can provide right-handed offense. They re-upped Chase Utley for a minimum two-year, $27MM guarantee covering his age 35-36 seasons, and Kligman could use that deal as a frame of reference. If things don't work out with the Phillies, the Red Sox, Yankees, Blue Jays, Rangers, and Braves could be fits for Ruiz. Ruiz signed a multiyear deal in January 2010 and ended up earning just $8.35MM for this three arbitration years. According to FanGraphs, his production from 2010-12 was worth $53.1MM. Since at least six years of Major League service is required for free agency, the timing often doesn't work well for late bloomers, and Ruiz may already be nearing the downswing of his career. Given the offense Ruiz provided as recently as 2012, he'll be a popular buy-low candidate on a one-year deal. I imagine Kligman will shake off references to Pierzynski's contract, however, initially aiming for a three-year deal. Ruiz's ceiling is probably Russell Martin's two-year, $17MM deal. Martin was coming off a better year and was five years younger, so it will be a difficult benchmark to pass. In the end I think Ruiz will sign a two-year, $14MM deal.